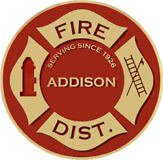 The Addison Fire Protection District will refund CPR class fees by refunding the credit card used during the purchase if the class is cancelled no less than 72 hours prior to the scheduled class start date and time. Cancellations made with less than 72 hour notice, but prior to the class start, will be issued a class credit for a future CPR class in the amount spent on the cancelled class. Cancellations made after the start date and time of class and/or no-shows to classes will not receive any refunds. Currently, the AFPD does not sell any products or items that are returnable. Addison Fire Protection District will collect and use information obtained from credit card transactions only for business purposes. These business purposes include the payment of CPR classes and other goods (if any) sold on our website. The credit card information provided by you to Addison Fire Protection District is not stored by the Addison Fire Protection District. Credit Card information is securely transmitted from our website to a secure third party credit card processing company. Our employees may access such information from the third party credit card processing company only when there is an appropriate business reason to do so, such as when a refund must be issued back to the credit card. We maintain physical, electronic and procedural safeguards to protect your information, and our employees are required to follow these privacy standards. The Addison Fire protection District does not disclose any nonpublic information (such as credit card number and their expiration dates) about our customers or former customers to anyone, except as required by law. We disclose information only when it is necessary for the conduct of District, State or Federal government business, or under circumstances where disclosure is required by law. Information may also be disclosed for audit purposes, to regulatory agencies or for other general administrative services. We do not disclose information about you to other entities who may want to sell their products to you. Addison Fire Protection District website uses Secure Socket Layer (SSL) protocol to ensure transaction security.